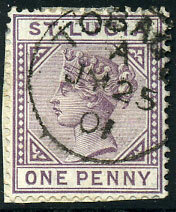 used rural post on QV 1d (SG.21), soiled etc. 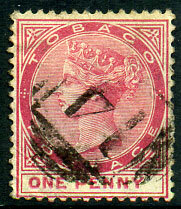 on QV 4d yellow-green CC wmk (SG.10, Cat.£35). 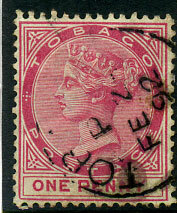 dated P/MR 9 92 on QV 1d carmine (SG.21). 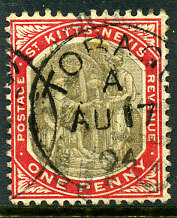 used rural post on QV 1d (SG.21). 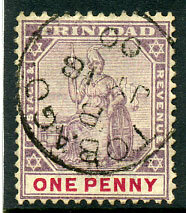 boxed type of the 14, 15, 16 Tobago rural numeral series on Trinidad 1904 1d Britannia (SG.134). Only two excellent and two poor strikes known. 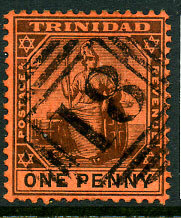 Numeral figures being 8mm high, not to be confused with the Trinidad Type 0.4 "18" used Princes Town which has numeral figures 7mm high. 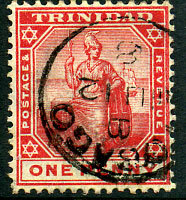 B/JY 18 00 on Trinidad 1d (SG.115). s/ways up B/JU 12 8 on Trinidad 1d (SG.135). A/AU 17 04 arrival on STK 1d (SG.2). dated FE 2(3?) 92 on QV 1d (SG.21).